Satellite view is showing the city of São Tomé, the national capital of São Tomé and Príncipe, a Western African island nation straddling the equator in the Gulf of Guinea east of Gabon. 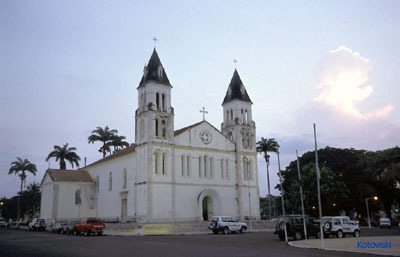 Sé Cathedral at São Tomé city. São Tomé and Príncipe is geographically relative close to the West African countries of Cameroon, Equatorial Guinea, and Nigeria. The islands have a population of 165,000 people, about 60,000 live in the capital. The map shows a city map of São Tomé with expressways, main roads and streets, zoom out to find the location of São Tomé International Airport (IATA code: TMS) situated in a distance of about 6 km (4 mi) by road northwest of the city center. Google Maps: Searchable map/satellite view of the City of São Tomé, capital of the Democratic Republic of Sao Tome and Principe.